Surround yourself with the sights and sounds of the city at New York Marriott Marquis. One of the premier hotels in Times Square, our central location gives you easy access to NYC entertainment options and several subway lines to access any part of NYC. Experience New Yorks most popular landmarks; Radio City Music Hall, Rockefeller Center, Central Park, Lincoln Center and Madison Square Garden, and do some Fifth Avenue shopping. Get relaxed and energized simultaneously as you step into some of the largest guest rooms in NYC, amid the hustle and bustle of famed Broadway. Dine at our signature revolving restaurant, The View, and enjoy picturesque city vistas or have a bite or a drink at our new outdoor lounge. With over 100,000 Sq. Ft. of event space, our Broadway Times Square hotel is the perfect choice for meetings & parties of any size. 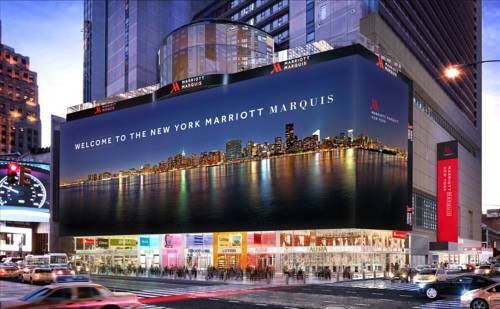 Visit New York Marriott Marquis and experience the excitement and excellent service for yourself! Indulge in savory flavors and exquisite spices while enjoying views of Times Square at The View. Our stylish New York eatery on Restaurant Row utilizes the freshest ingredients for an exceptional dining experience. The Broadway Lounge offers exciting menus, snacks, appetizers and drinks to fit the schedule of those looking for pre- or post-theatre fare. Guests can also enjoy the outdoor patios overlooking Times Square. Wondering where to eat in Times Square? Head to Crossroads American Kitchen & Bar for breakfast, lunch or dinner. We offer an elaborate breakfast buffet, flavorful soups and salads and fresh-ground Angus beef burgers. Quick and easy, the tasty favorites of Starbucks are served all day long featuring everything from gourmet coffee and tea to pastries and quick snacks. Enjoy fresh, authentic, locally sourced food without the fuss. All orders include eco-friendly utensils, napkins, and cups; everything you need to enjoy in your room or on the go. Call Fresh Bites at extension 1 from your room to place your order.